Connecticut Education Commissioner Dianna Wentzell, center, and other witnesses listen to Parkland, Fla., teacher Stacey Lippel testify about how she tried to protect her students from shooter Nikolas Cruz. Washington – Connecticut Education Commissioner Dianna Wentzell on Tuesday helped congressional Democrats push back against President Donald Trump’s school safety initiatives, including proposals to arm teachers and review Obama-era policies that encouraged educators to consider alternatives to detention and expulsion. “When law enforcement officers descend on the chaos of a school shooting scene and there are multiple people holding guns, they will not have the opportunity to distinguish the good guy with a gun from the murderer. Our teachers did not sign up for that,” Wentzell testified at an ad hoc hearing on school violence by House Democrats. Hours after another school shooting occurred in St. Mary’s County, Md., on Tuesday, Wentzell hailed the student movement sparked by last month’s shooting at Marjory Stoneman Douglass High School in Parkland, Fla.
Also testifying was Stacey Lippel, an English teacher at Marjory Stoneman Douglas High School who was less than 20 feet away from Nikolas Cruz, who killed 17 at the school, including two of Lippel’s students. Lippel gave a harrowing and tearful account of the Valentine’s Day shooting and her frantic efforts to pull students into her classroom to safety. Attended by House Minority Leader Nancy Pelosi, D-Calif., the hearing is not likely to result in new legislation. But Democrats wanted to emphasize the importance of preventing violence and the need for more training so teachers can identify troubled, and possibly dangerous, kids before there is a problem. There also was strong support among the lawmakers and their witnesses for more counselors, social workers and mental health experts in the nation’s schools. “We ought to honor our teachers with skills, not guns,” Pelosi said. Like several others, panel member Rep. Elizabeth Esty, D-5th District, said money spent after the Newtown massacre on fortifying schools to protect them from an active shooter would be better spent on preventive measures. Several witnesses hailed a program developed by Sandy Hook Promise after the 2012 mass killing in Newtown to train school personnel, students and law enforcement to identify signs of potential violence and prevent it. “The Sandy Hook Promise program is a gift from Connecticut to the nation,” said Akin Ross, the principal of Chapin High School in Chapin, S.C.
Last week, Trump announced a series of gun violence and school safety initiatives that included providing “rigorous firearms training” and asked Education Secretary Betsy DeVos to lead a school safety commission charged in part with examining the repeal of an Obama administration policy aimed at reducing expulsions and suspensions that disproportionally affect minorities. DeVos was invited to testify, but declined. 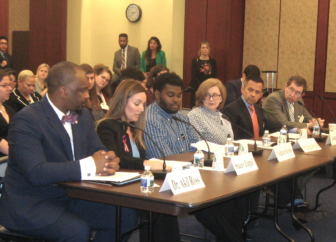 The U.S House of Representatives last week approved the STOP School Violence Act, legislation that provides $50 million in grants to programs that help schools spot troubled students and try to help them. The legislation, which has yet to be considered by the Senate, also would help schools make investments in reporting and threat assessment systems, as well as security equipment. Other than approval of the STOP School Violence Act on the one-month anniversary of the Parkland shooting, Congress has failed to take any steps to address school violence and ignored a series of gun bills, even a proposal endorsed by Trump that would encourage states and federal agencies to improve their reporting to the National Instant Background Check system of gun purchasers. Students are expected to march on Washington Saturday demanding Congress act. Esty said the young activists make her more hopeful. “I feel a wind is blowing and change is coming,” she said.